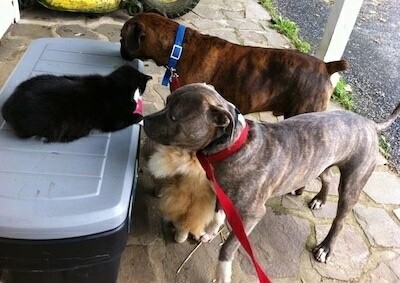 Bruno the Boxer and Spencer the Pit Bull Terrier with their cats. 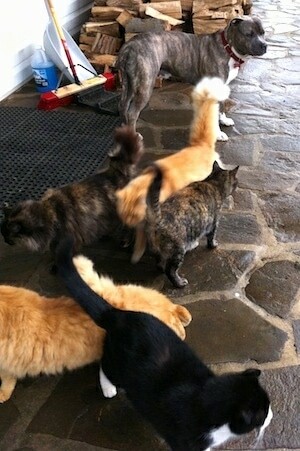 It is an old wive’s tail that cats and dogs are natural enemies. There are some dog breeds that will chase and sometimes kill cats, but those breeds would also chase and kill a rabbit just as quick. 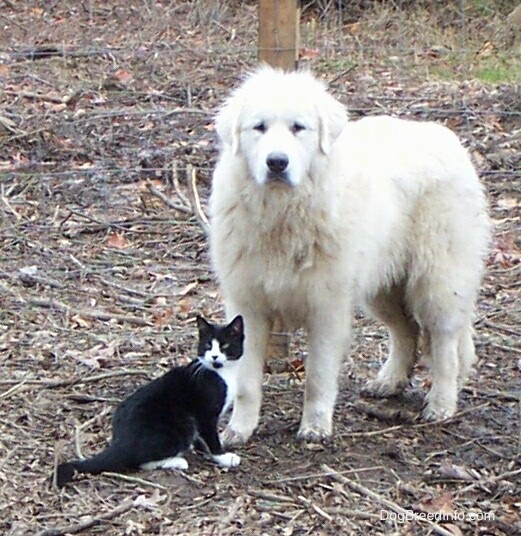 In most cases cats and dogs can live in harmony if properly socialized and introduced, preferably when one or both of the animals are still young. In a lot of cases you will find the cat is dominant over the dog. 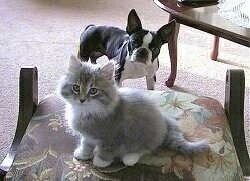 There is something about that 10-pound cat that can really intimidate the 200-pound Bullmastiff. 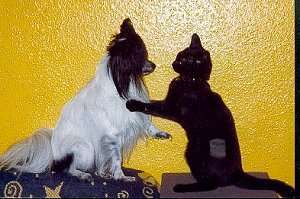 This is a Papillon dog and a black cat. 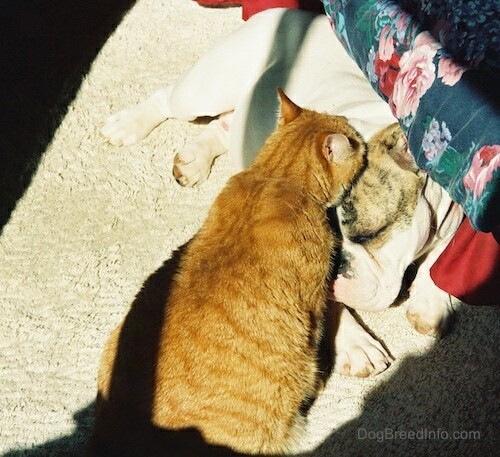 Read about Spike the English Bulldog and Rusty the cat. Read about their first encounter! Razor's Edge American Bulldogs and Boston Terriers. 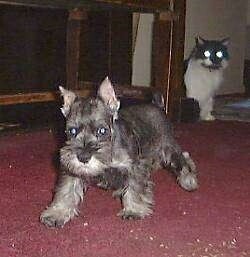 "Three-month-old Dexter, a Miniature Schnauzer puppy and the very watchful cat!" 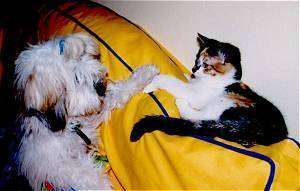 This is Lady (Lhasa Apso dog) asking Boo Boo (cat) to marry her, because they just love each other....WOOF!!!!!! 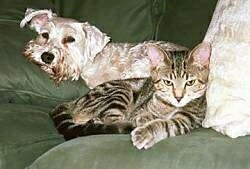 Sam (the Schnauzer) and Rufus (the cat). They are almost best buddies. 8:00 a.m. - Dog food! My favorite thing! 9:30 a.m. - A car ride! My favorite thing! 9:40 a.m. - A walk in the park! My favorite thing! 10:30 a.m. - Got rubbed and petted! My favorite thing! 12:00 p.m. - Lunch! My favorite thing! 1:00 p.m. - Played in the yard! My favorite thing! 3:00 p.m. - Wagged my tail! My favorite thing! 5:00 p.m. - Milk Bones! My favorite thing! 7:00 p.m. - Got to play ball! My favorite thing! 8:00 p,m. - Wow! Watched TV with the people! My favorite thing! 11:00 p.m. - Sleeping on the bed! My favorite thing! Day 683 of my captivity: My captors continue to taunt me with bizarre little dangling objects. They dine lavishly on fresh meat, while the other inmates and I are fed hash or some sort of dry nuggets. Although I make my contempt for the rations perfectly clear, I nevertheless must eat something in order to keep up my strength. The only thing that keeps me going is my dream of escape. In an attempt to disgust them, I once again vomit on the floor. Today I decapitated a mouse and dropped its headless body at their feet. I had hoped this would strike fear into their hearts, since it clearly demonstrates what I am capable of. However, they merely made condescending comments about what a "good little hunter" I am. The audacity! There was some sort of assembly of their accomplices tonight. I was placed in solitary confinement for the duration of the event. However, I could hear the noises and smell the food. I overheard that my confinement was due to the power of "allergies." I must learn what this means, and how to use it to my advantage. Today I was almost successful in an attempt to assassinate one of my tormentors by weaving around his feet as he was walking. I must try this again tomorrow—but at the top of the stairs.